Rescue workers scrambled Friday to find more survivors from a four-story building that collapsed in Islam's holiest city, killing 76 people and marring the start of the annual gathering of millions of pilgrims. Under spotlights, hundreds of men worked with cranes and other tools through the night to remove huge slabs of concrete from the site of Thursday's collapse. Some workers cut through steel girders with blow torches and others used microphones to listen for signs of life. "I believe that people are trapped and I still hope to find some survivors," said Brig. Hamad al-Ahmadi, who oversaw the night operation. Relatives of people who were in the building waited all night at the scene for news of their loved ones. But rescue workers recovered only dead bodies Friday. As the rescue operation continued, more than 1 million pilgrims headed to the nearby Grand Mosque for Friday prayers. They have come to Mecca for the annual hajj pilgrimage that begins Monday. The building that collapsed, Lulu'at al-Khair, is just 200 feet from the Grand Mosque. It housed shops and restaurants and is used as a hotel during pilgrimages. Talha al-Nizi, a Tunisian guide for pilgrims, said his group had just finished midday prayers Thursday and returned to their hotel adjacent to Lulu'at al-Khair. "As I moved to step into my hotel, the whole building collapsed in front of my eyes. The whole street was full of dust," said al-Nizi, who used his mobile phone to capture video and still images of the collapse. 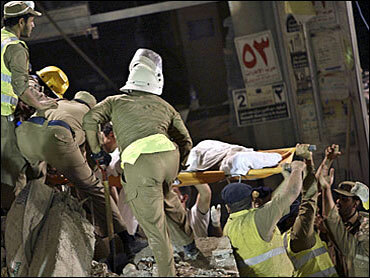 About 1,000 rescue workers, medics and police were quickly deployed around the collapsed building. "Fortunately the building was almost empty when it collapsed, because most of the residents were in the holy shrine at that time," civil defense Maj. Gen. Alwani, who did not provide his first name, told government-run Al-Ekhbariya television. "Most of the casualties were from the passers-by near the building." A government official, who did not identify himself, told Al-Ekhbariya that the 40-year-old building's foundations were cracked and weak. Neighboring buildings were evacuated as a precaution, the network reported. However, the operator of the hotel, Habib Turkestani, told The Associated Press that the 25-year-old structure was sound. "The building was in good shape, and what happened was a matter of fate and divine decree," Turkestani said.